As far as this decade is concerned, this is the ultimate Spider-Man. Multiple Spider-Mans makes for outrageous fun in Marvel’s slick, constantly surprising multiverse animation. Since Miles Morales first burst onto the pages of Marvel Comics, the publisher has been ramping up the number of “legacy characters”, with Jane Foster taking the mantle of Thor, Falcon becoming Captain America, and the introduction of Kamala Khan as Ms Marvel. 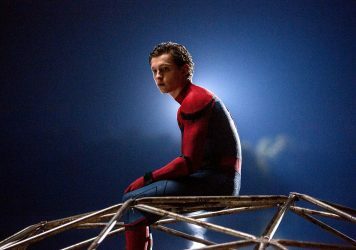 As with Miles replacing Peter Parker, each of these examples received significant pushback from fans who protested that no one can replace the original character. Spider-Man: Into the Spider-Verse directly addresses this line of thinking in its opening monologue, as Peter claims confidently that, “there’s only one Spider-Man”. The film doesn’t only reject that idea, but revels in the possibilities that come with having more than one, the boundless imagination of its creators all used in service of the idea that it’s far more fun to share. Directed by Bob Persichetti, Peter Ramsey and Rodney Rothman and co-written by Rothman and Phil Lord, Into The Spider-Verse is an amalgamation of Brian Michael Bendis and Sara Pichelli’s Ultimate Spider-Man and Dan Slott’s wacky Spider-Verse event comic, and a number of others. 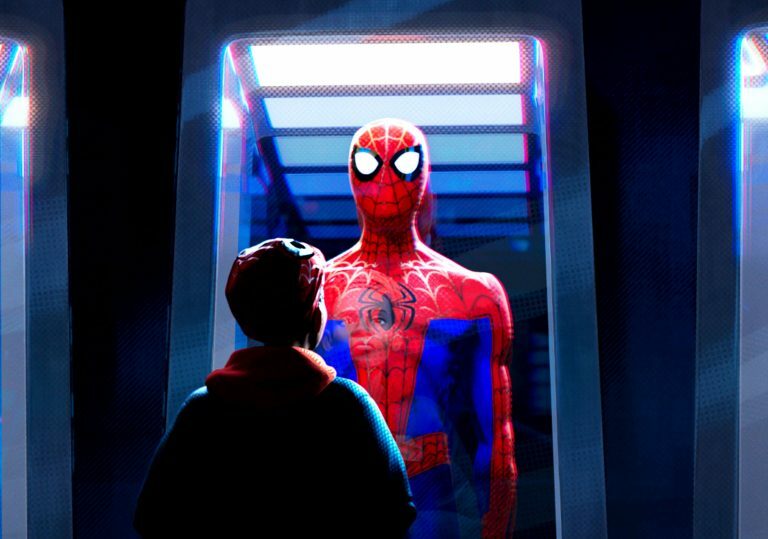 The film follows Miles (voiced by Shameik Moore), an Afro-Latino teenager and soon-to-be Spider-Person living in Brooklyn with his cop father (Bryan Tyree Henry) and nurse mother (Lauren Vélez). When Miles is bitten by a spider, his world gets a lot bigger. 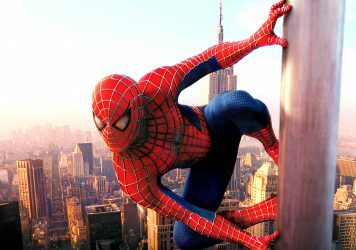 He learns not only that there can be more than one Spider-Man, but more than one dimension, as a plot put in place by the Kingpin (Liev Schrieber) causes a bunch of them to collide. The film takes great pleasure in adapting the comic book aesthetic to the screen in a way that hasn’t really been attempted since Ang Lee’s Hulk 15 years ago. It’s full of artistic flourishes that pay homage to the form, with transitions that look like pages flipping, liberal use of panels, written sound effects and onomatopoeia (look out for the “bagel!” sound effect), yellow caption boxes, and freeze frames that echo splash pages – all of which burst into the film following Mile’s spider-bite. Early skeptics of the lowered frame rate can rest easy: the animation is slick and eye-poppingly gorgeous, hitting a striking halfway point between stop motion, rotoscoping and comic book art itself, replicating the colour schemes and texture of four colour Ben-Day dots printing. It gives the impression of flipping through the pages of old comics while on psychedelics, the film winking at us from the get-go with the message that it was “approved by the comics code authority”. At its core, this is essentially an origin story for Miles, but one with surprise twists on famous Spider-Man characters and a refreshing self-awareness about its place as the seventh Spider-Man movie (the fourth in the last decade alone). It constantly subverts our expectations while staying true to the essence of the Spider-Man mythos. There are still what Peter refers to as “the usual Spider-stakes”, but this is ultimately a character-driven film. 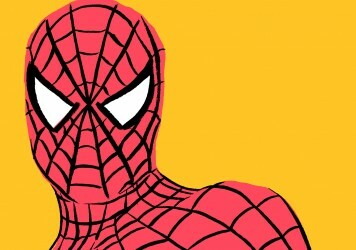 While Miles, Peter and Gwen Stacy (Hailee Steinfeld) get most of the spotlight, the other Spider-people – including Peni Parker (Kimiko Glenn) and her giant robot ‘Sp//Dr’, the Bugs Bunny-esque cartoon Spider-Ham (John Mulaney), and Spider-Noir (Nicholas Cage, out-hamming the actual pig) – mostly serve as comic relief. Jake Johnson is particularly note-perfect as a “janky, broke,” lonely and cynical thirtysomething Peter Parker with a dad bod. Johnson and Moore bounce off each other well; Peter and Miles’ mentor-mentee relationship is consistently delightful and sometimes moving, as each teaches the other how to be hero. Moore’s charming and vulnerable vocal performance helps make the character feel more authentic than ever, and when it comes to his Afro-Latino identity, there’s a specificity here that isn’t often found in mainstream superhero films. An early standout scene simply involves him walking down the street, constantly code-switching while talking with the different people in his neighbourhood. The soundtrack is also used to great effect in giving Miles some definition. Each needle drop or cue on the soundtrack feels tied to the characters, mixing in record scratches, various needle drops of funk, soul, boom-bap and Latin hip-hop and more with the the more traditional superhero sounds. Spider-Man: Into The Spider-Verse is outrageous fun, with an endlessly imaginative script and animation to match. It’s the first superhero film in ages to truly feel without limits and full of surprises – and yet, the (large) team of writers and directors bring things back to the central idea of the character that Stan Lee and Steve Ditko envisioned all those years ago. The film uses its multiverse concept to tap into the original appeal of Peter Parker and the potential of Miles Morales as a character. They’re regular people, and so anyone could be Spider-Man. The director’s 2002 franchise opener is a tribute to this iconic city and the people who live in it.